Equipped with 6000ton oil press machine, we can produce many large forgings according to customer drawings and requirements. They are used in vessel industrial, oil drilling industrial, the valve industrial, pressure vessel and port machinery. The large forgings can be divided into three categories according to the geometry. 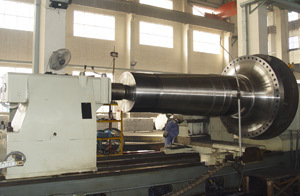 Shaft Forgings: Max diameter 4000mm, Max weight 70 tons. Disc Forgings: Max diameter 4500mm, Max weight 50tons.